New Seasons Market is recalling its New Seasons Market Grab and Go pre-packaged Macaroni and Cheese. The UPC Code is found beneath the bar code and the Sell By Date is on the top right side of the product label. 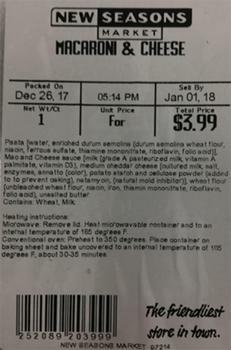 The recalled product, with with “Packed On” dates between 12/19/2017 and 12/28/2017 and “Sell By” dates up to 1/02/2018. was sold at New Seasons’ 21 locations in Oregon, Washington and Northern California. Customers with any egg health concerns or allergies who purchased to recalled product should return it to the place of purchase for a full refund. Receipts are not required for the return. Consumers with questions may contact the company by email at talktous@newseasonsmarket.com.